I think that human language can no more accurately describe God’s interaction with his creation than frog language can accurately describe the complex interaction of quantum particles. We say God is infinite, perfect and eternal but how can any finite, imperfect, and temporal human can possibly understand what any of these things actually mean? The difference between a mere human being and God must be unimaginably greater than even the difference between a human and an amoeba. 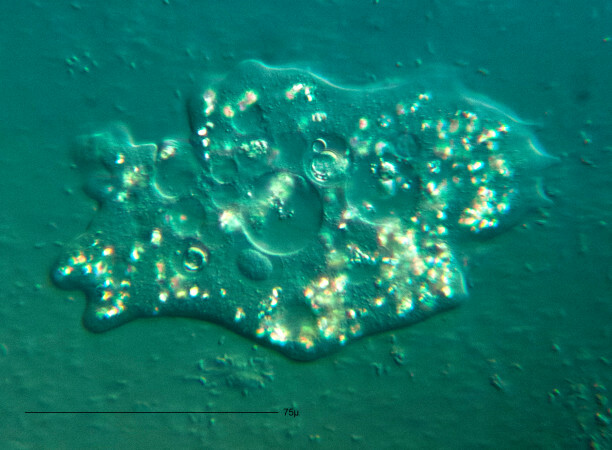 How can a human communicate effectively with an amoeba? How can an amoeba even begin to understand the mind of a human? We often ask “Why?” but even if God chose to explain certain mysteries to us, we would very doubtfully have the capacity to understand. I think it is better to trust in God’s obvious benevolence – Although it is true that we often “believe” things could somehow be better but we are usually pretty vague on the details. On the other hand, don’t we usually “know” beyond a doubt that things could be much worse in very specific ways? If we can acknowledge this simple fact with our extremely subjective and incredibly limited perspective, how much greater would God’s overall benevolence appear if we could begin to understand the bigger picture? This entry was posted in God, Ponderings, Prayer and tagged God. Bookmark the permalink.